Now that Lil’WOOF Reading Program is beginning to evolve to Lil’WOOF Corner Authors and Books, we are meeting new authors all the time. In this case these two authors reached out to us, and we were completely paws-itively happy they did! Our feature authors are Kari Sherman and Carey Laubenberg. There friends Max and Luther help us to understand what its like to be a dog, play like a dog and live like a dog. When I read their authors biographies I completely understood where these two fabulous friends met. You see I too met one of my dearest friends at a dog park, she’s no longer with me, but I treasure the time we spend together. Our dogs Jackie (who you’ve met and read her story over the year) met a Kobo (who was a great chocolate Labrador). 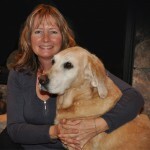 As Jackie and Kobo became best friends, as did Max and Luther, so did their owners! All because of a dog park! I learned that Max is a two-and-a-half-year-old Puggle (half-Beagle, half-Pug) with an all-beagle personality. I understand that Max has the same obsession with food as our Miya does. Looks this new friend of Miya’s would do anything to get a treat out of anyone. Luther “Lou” on the other hand is a one-and-a-half-year-old Olde English Bulldog. I read that Luther is a big lug. When you see him coming, it’s best to get out of the way. However is also the sweetest and gentlest of dogs (Sounds like our friend Kobo). Now I just knew that these two would become the best of friends. As we read Max and Luther’s story the authors have incorporated great tips that every dog owner should know, understand and observe especially at the dog park or even at home. Miya for one was happy when she learned that she wasn’t the only one who thought other dogs poops was a delicacy! Anyway I don’t want to spoil anymore tid-bits from this truly enlightening and funny book. I’ll leave you to enjoy the book and as you read it learn new things or confirm funny things about your own dog. Our next step is to have our Lil’WOOF Corner readers enjoy this tail and report of what thought of the book next. Our dogs, Max and Luther met at the local dog park 2 years ago and became instant best friends. Naturally that also meant that their pet parents, Carey and I, became friends too. After watching our dogs play at the dog park, we thought that all the funny things we saw there would make a great book. Carey and I came up with the idea that the dogs should tell the stories and come up with the rules and advice for us humans. The short stories highlight why we think these rules and advice are important. It was also our thought to make the books both entertaining and educational for dog lovers of all ages. After the first book did so well, we wrote another book with more funny stories and added some fun dog facts as well. Max and Luther also came up with some top ten lists of their favorite things. Again, the idea was to be both entertaining and educational. Carey and I are first time authors and because of our love for not only our dogs but all dogs, writing these books became a labor of love. We donate a portion of our sales to our local Humane Society because we wanted to give back to all dogs in need. This is a second career for both of us as well. I worked in corporate America for over 20 years and Carey was a personal trainer. It was our mutual love of dogs that lead us to a new career as authors of dog books. We are planning more books in the Max and Luther series. Max and Luther two dog park friends who spell out the way it is for us pet owners to be responsible owners in a funny and enlightening way. A great Kids Literature Book for you to read, as well as to read to your children or have them read it too. 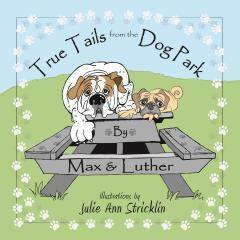 If you have read any of the Max and Luther True Tail adventures, we would really like to hear from you. Please leave a comment below. In the meantime, pick the book or books up and enjoy Max and Luther’s adventures. As a life-long dog parent and enthusiast, I can’t get enough of all things doggie! 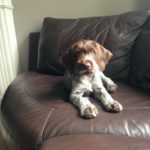 My love of dogs and passion to educate and share solutions with other dog owners, is essentially how this site came to be. With the help of my three dogs I will provide engaging ‘tails’ and real life-lessons learned on dog ownership. Lil’Woof Corner has a new Dog in her family. His name is Koda. He came to our family almost a year ago now. Here is a story about Koda! Meet Cooper a new den-mate to our Miya, Meesha and Koda who is our November Dog of the Month! He is a feisty Wirehaired Pointing Griffon. This family waited a long time to get Cooper and now is here. 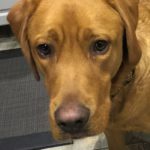 Dog Daycares: What to look for when picking the “right fit” for your dog and you!